Far North Holdings is warning that a temporary parking area will replace parking next to the Opua boat launch ramp between August and mid October 2017, while the main area is resurfaced and marked out. 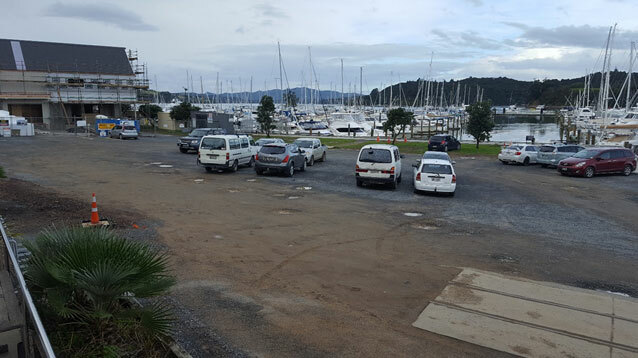 The gravelled surface of the car park will be replaced with a full tar seal as part of the Bay of Islands Marina expansion project. The re-surfacing has been timed deliberately to avoid the summer tourism season. Work will require the entire car park area outside the new marina building, the existing café building and across the front of the launch ramp to be sealed off. Replacement parking will be provided in the space previously occupied by Total Marine Services as the base for its work on the marina expansion. The launch ramp will still be accessible from the temporary replacement parking area but Far North Holdings managing director Andy Nock is asking ramp users to be patient and to be aware of the temporary parking and traffic flow. “We’ve done what we can to ease congestion but we want people to consider launching elsewhere, possibly at Waitangi, if they possibly can. Particularly on the days we seal around the ramp which may require having to close it,” said Mr Nock. “It’s going to look fantastic when it’s finished and of course everyone will have improved launching facilities at their disposal when work is complete,” Mr Nock said. “We’re grateful for our community’s patience so far and ask that they bear with us for just a little longer while we seal the parking area. general rates would have been approximately four percent a year higher, each year, over this period.